NEC Enterprise Solutions, global leader in ICT solutions, has appointed Blue Ocean Global as its master distributor for SMB communications solutions in the United Arab Emirates. 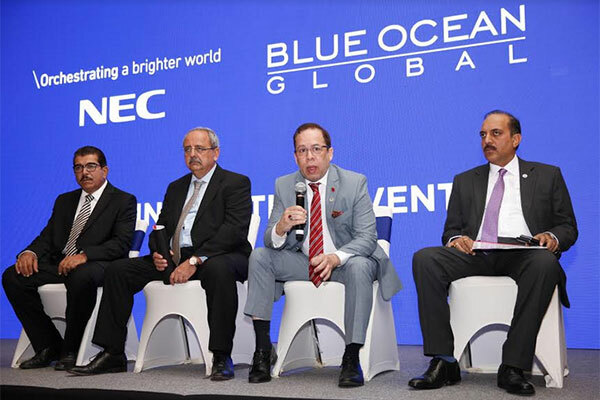 Blue Ocean Global will provide resellers in the UAE, Oman and Iraq with NEC’s latest range of advanced communications solutions for enhanced productivity, efficiency and business continuity. Blue Ocean Global is a leading distributor of communication solutions with a network of about 250 telecom resellers nationwide and will distribute the renowned NEC UNIVERGE SV9100 and SL2100 communication servers and their powerful range of terminals and business applications. The partnership will help NEC’s telephony products to penetrate deeper in the corporate world, small and medium businesses as well as the growing number of households. Blue Ocean Group’s strong network of distributors and re-sellers will ensure increased sale of NEC telephone and accessories in the UAE and beyond. Fixed-phone subscription base is expected to grow from 1.2 billion in 2011 to 1.55 billion this year and 1.66 billion by 2025, according to the International Telecommunication Union. NEC Corporation become the leading vendor in the global Call Control (PBX-IP PBX) extensions/ licenses market in December 2018, taking the no. 1 position as worldwide market leader in MZA's latest Call Control (PBX-IP PBX) report for Q3 2018. With a market share of 14 per cent, NEC was ahead of all other companies in the report. The success underscores the strength of NEC's portfolio of communications solutions, the company's commitment to expand its global enterprise communications footprint and the ability to serve customers worldwide. "We are particularly proud to become Master Distributor for NEC in UAE, the Global No.1 in the IP-PBX Call Control market. Their communication systems are characterised by excellent functionality, unrivalled reliability and excellent value for money,” said Shahzad Ahmed, chairman and CEO of Blue Ocean Global. ”The broad and powerful portfolio of this world leader enables us to further expand our offering in the market and we expect to expand our network in the coming period in order to meet the increasing demand in the region and fulfil our growth ambitions." NEC offers a broad range of enterprise communications solutions - ranging from small to very large systems that effectively support enterprise and SMB customers whose requirements span from traditional TDM to full IP and 100 per cent software-based deployments. The global hosted PBX market size is expected to grow from $4.73 billion in 2018 to $9.50 billion by 2023, at a CAGR of 14.9 per cent during the forecast period, according to Research and Markets, one of the world’s largest market research organisations. The hosted PBX market is gaining traction due to the rising need of enterprise mobility and rising adoption of the cloud and unified communications, the report said. Furthermore, low CAPEX and TCO, and the necessity to upgrade from traditional PBX to cloud-based PBX are driving the market. However, security and privacy concerns are restraining the hosted PBX market growth.